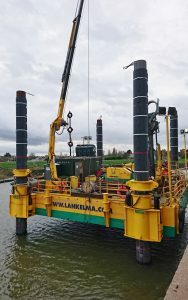 Our jack-up platform Sandpiper is playing a key role on an investigation for a flood defence scheme in the east of England. We have been commissioned by the BAM Nuttall and Mott MacDonald joint venture to carry out 13 overwater CPTs from Sandpiper, four of which will include seismic and pressuremeter testing, to target depths of 25m. Onshore testing will be carried out by one of our track-truck CPT rigs at 18 locations, eight of which include seismic and pressuremeter tests, again to target depths of 25m.